Completed Xtracycle bike with Stokemonkey pedal assist system. Over the summer, a customer approached me about building a Ferguson city bike with a pedal assist drive train built in. Since he wanted to also keep the internal hub, we turned to the Stokemonkey system from Portland. Since this system requires a quite a bit of space behind the seat tube, a long tail bicycle was designed. 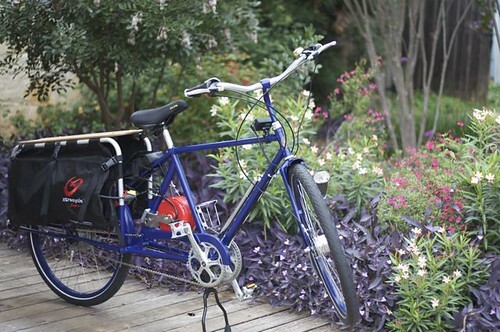 To give the customer the most accessory flexibility, the Xtracycle platform was chosen.